(BALI, INDONESIA) – Fontana Hotel Bali, the ultimate address for travelers seeking unique, affordable and stylish stay in Bali, offers a special package during the holiday season of Ramadan & Eid ul-Fitr. The package addresses to families, as well as leisure and business visitors to come together and experience the true spirit of hospitality. "Ramadan & Eid ul-Fire is time of togetherness and sharing. We would like to take the opportunity to extend our stylish hospitality to all our guests on this sacred occasion. As we all probably know, Ramadan & Eid ul-Fitr is a festive holiday season in some countries, hence this package is not only intended to those who celebrate, but for Ramadan & Eid ul-Fitr period itself where other religions could also get the special deal from Fontana Hotel Bali," said Komang Sri Dewi, the Director of Sales of Fontana Hotel Bali. "In this package, people could choose to stay 2 nights or 3 nights in our Superior or Deluxe Room. The rate starts from IDR 1,650,000 to stay for 2 nights and IDR 2,000,000 to stay for 3 nights. So, actually people will get more cost effective rate when they take the 3 nights stay. This package includes some other benefits too; like free passes to Waterbom Bali which include return transfers, daily breakfast where Sahur will be provided for those who is fasting and Eid ul-Fitr meal where guests could experience the food created by our Executive Chef Vittorio Negri," she added. In addition to these irresistible room promotion, Fontana Hotel Bali provides return airport transfers, free daily minibar, welcome drink and free Wi-Fi in all hotel area. Fontana Hotel Bali knows how to pamper their guests with its friendly and professional service; it is proven by keeping their position at Ranked No. 1 out of 157 hotels in Kuta area at Trip Advisor since May 2013. "It is an achievement that we should maintain. We receive so many compliments from our guests which become our numero uno motivation, to deliver the best service to our guests," Komang Sri Dewi said. Since its Grand Opening in 15 December 2012, Fontana Hotel Bali has well-provided business facilities for corporate groups, wellness and leisure facilities for health-conscious travelers and superb dining options. This hotel really is a complete venue to spend the holiday during the festive moment of Ramadan & Eid ul-Fitr. Alibi Bar is a part of U Paasha’s prestigious hotel facilities, operating daily at 18.00 PM to 01.00 AM. The venue will serve extensive varietals of premium wines, liquors and designer cocktails. The beverage offerings will feature a large selection of imported wines and more trendy drinks, such as molecular cocktails. 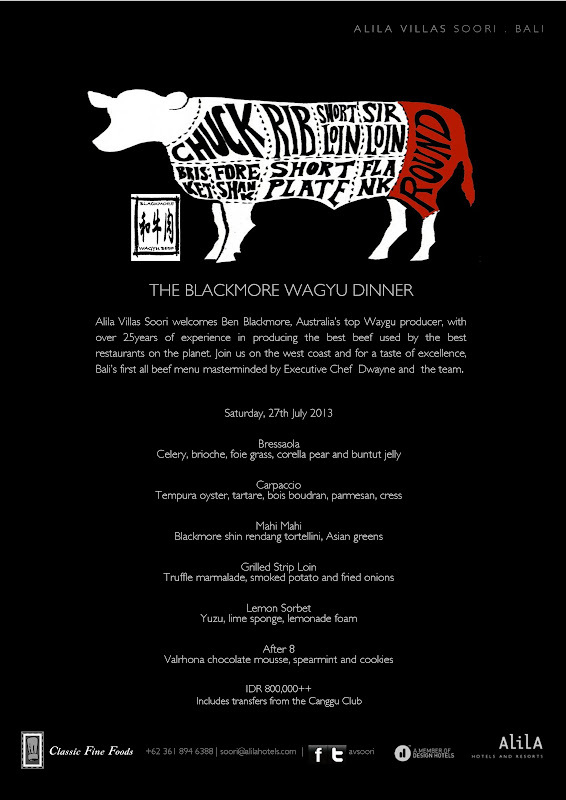 Alila Villas Soori welcomes Ben Blackmore, Australia's top Wagyu producer with over 25 years of experience in producing the beef used by the best restaurants on the planet. Join us on the west coast and for a taste of excellence, Bali's first all beef menu masterminded by Executive Chef Dwayne and the team.